It can be really tough to figure out what to crochet for the men in our lives. While some enjoy our crochet socks, scarves, and sweaters, others don't like them as much - or maybe they've just received so many from us that they need something new. How about a crochet necktie? This is the kind of fun present that a guy can be proud to wear - a little funky but also a neat handmade token of your affection. The crochet necktie is the quintessential gift for Father's Day but it also works for Dad's birthday or Christmas or just because. Dad will think of you every single time that he wears that tie or even notices it hanging in his closet. And of course, this doesn't have to be something you only make for Dad. A crochet tie is something that any guy in your life could receive; you can even make little ones for the boys you know. And in this day and age, many women like to wear neckties, too, so you might even find that these necktie crochet patterns will be suitable for them! 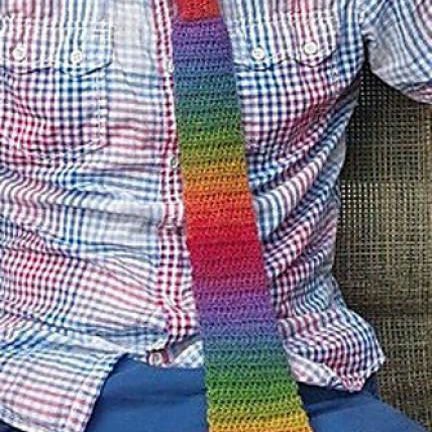 This rainbow crochet necktie pattern uses self-striping yarn to create a bold design without requiring you to make color changes. Of course, you can use whatever yarn you'd like, so if Dad's style isn't bold enough for the rainbow, you can choose a solid-colored yarn or a more muted variegated yarn instead. This crochet tie pattern uses the half double crochet stitch, relying on easy increases and decreases for the shaping. It's customizable so you can easily make this tie wider or thinner, longer or shorter, based on the recipient's size and style. 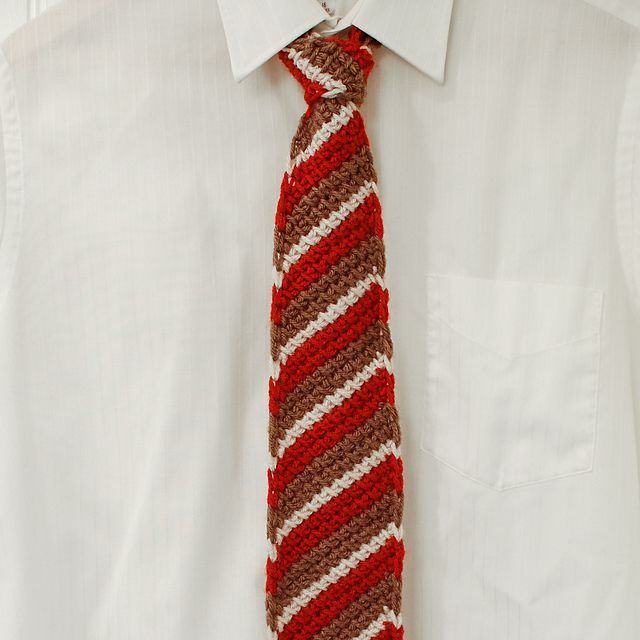 This is a classic crochet necktie pattern, available at an affordable price through Ravelry. This skinny tie is a design that would be a great choice for anyone, although it's especially well-suited to the contemporary style of young men. It requires a little bit of sewing; the instructions for that are included in the pattern. The skinny tie is associated with the hipster style but it is also inspired by vintage crochet, as was the case with this design. The little details make this pattern stand out above others. There is the loop in the back for properly tucking the tie in. Plus there's a great simple crochet edging that gives the necktie a polished look. In direct contrast to the modern appeal of the skinny hipster tie is the extra wide alternative of a crochet cravat. The cravat originated in the 16th century and is considered the forerunner to the tie; it has been made popular again by the steampunk movement. This crochet pattern is part of the designer's "Tea & Cowls" collection. You will find tie patterns in some of their other collections as well, such as the Nicollet Avenue Tie in the Minneapolis collection. Most crochet ties are worked top to bottom without seaming. However, another option is to make small motifs then join them in the right shape to make a great crochet necktie. The classic granny square is a great motif for a really fun necktie, as we can see from this free pattern. Tunisian crochet has a sophisticated knit-like look. If that's the style that you prefer, this free crochet necktie pattern is one to bookmark. It uses simple Tunisian stitches worked in a diagonal for a twist on the classic tie design. The three colors chosen by the designer give the tie a retro look; vary your color choices for different effects. This is another option for a crochet tie worked in lightweight yarn, just slightly thicker than thread. It's a well-constructed striped tie that can be crafted in 2 or 4 colors. The pattern has a simple three-row repeat, making it just interesting enough to keep your attention but still allowing for some meditative crafting time as you make it. TOFT describes this as a "school tie scarf", indicating that this is a crochet scarf pattern designed to look like a school uniform tie. It is a funky unisex design with a bit of retro style. It is made with a DK weight yarn, which is lightweight, but it's a wool yarn, so it is also cozy. Looking for an easy crochet tie pattern for a little boy? This one is designed to work up simply, with cute shaping, and it clips on so there's no tie technique to worry about. This is great for pictures, holidays and special events. Make it in colors to match dad's tie for a great daddy-and-me look.